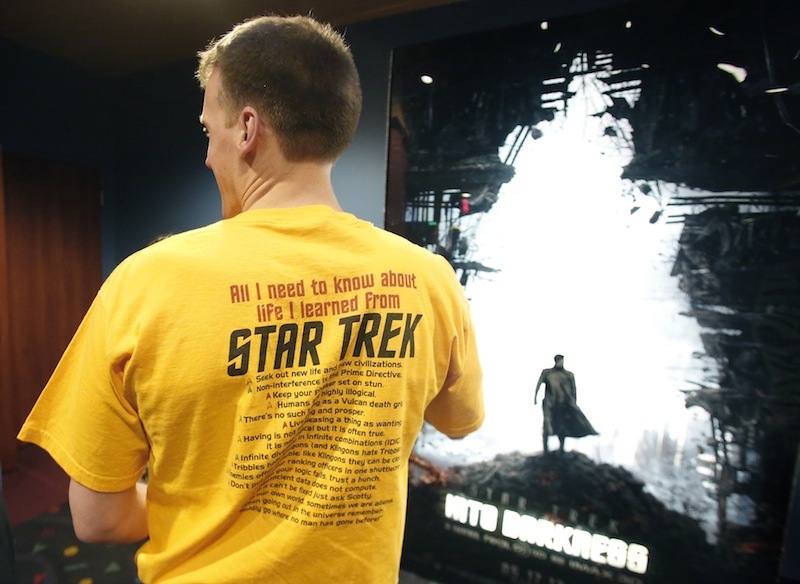 The franchise's latest film, 'Star Trek Into Darkness,' opens widely Thursday, but Saco Cinemagic held a special screening Wednesday night. Many dressed in garb from the TV show and movie series, they began lining up in the early afternoon and flooded the theater when doors opened at 6:30 p.m. for an IMAX 3D screening that began at 8 p.m.
Saco Cinemagic was among fewer than 300 theaters nationwide, and the only one in Maine, that screened the movie Wednesday. It opens widely Thursday. Among those who turned out in uniform was Brad Siegel of Cumberland. He’s been a fan of the TV show since its early days and has seen all the movies. He was wearing a gold jersey similar to those worn by the crew of the Enterprise, the star ship that is home to the “Star Trek” crew. Asked why he dressed up, he compared himself to fans of the Boston Red Sox or Boston Bruins who wear the colors of their favorite sports teams. As he talked, he flashed the Vulcan salute — a friendly hand gesture — to a fellow Trekker walking through the theater lobby.At the other end of the spectrum was 16-year-old Olivia Bradstreet of Old Orchard Beach. She’s a new member of “Star Trek” fandom. She’s seen the TV shows, and became a fan in 2009 when the last movie came out. For Wednesday’s screening, she wore a red “Star Trek” dress that her father made for her when she was 12. “I’ve been anticipating this for four years. It’s very exciting,” she said, clutching her ticket stub. The new movie is a major development for those people who care about such things. “Star Trek Into Darkness” is expected to be the top movie at the box office this weekend, according to predictions in E! magazine. Wednesday’s screening drew fans from across the state and the Canadian Maritimes. Directed by J.J. Abrams, “Into Darkness” is the only big new opening on the docket this week, and should knock “Iron Man 3” and “The Great Gatsby” down to the second and third spots in the box-office receipts lineup. Abrams also directed the 2009 “Star Trek” movie. The new film stars Chris Pine as Capt. Kirk and Zachary Quinto as Spock. Benedict Cumberbatch, of “Sherlock” fame, plays a mysterious desperado who plots the demise of the spaceship Enterprise. The movie is full of action and drama, a bit of romance and lots of high-tech hijinks. Siegel appreciates the level of detail and dedication that Abrams has brought to the project. The movie is full of references that die-hard fans will appreciate, while staying true to the characters and characteristics of the early TV series, he said. Correction: This story was updated at 11:45 a.m., May 16, 2013, to correctly identify Olivia Bradstreet, whose father made her red “Star Trek” dress when she was 12.